Founded in 1917, the name JOEWELL is recognized by the professional hair stylists around the world as what represents the finest of Japanese-made high performance scissors. JOEWELL delivers products, which better match customer needs for more precise and consistent quality by using a uniform system from design consideration during new product development to standardization and quality control in the manufacturing process. 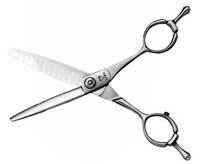 In order to accommodate every hand that holds scissors with varying designs, sizes and blade materials. The wide range of product-selectivity lets JOEWELL users to choose products best satisfy their tough requirements. We stock the complete range of JOEWELL scissors.